A not so long time ago, in several galaxies far, far apart a new adventure was born. Star Tours opened its doors to interstellar travelers at Disneyland California in 1986. 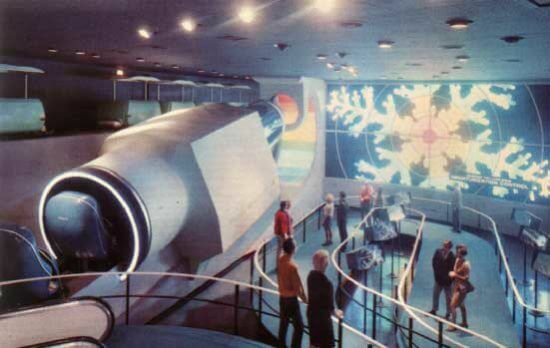 Star Tours took over the location that was home to Adventure Thru Inner Space. The Monsanto sponsored inner space attraction operated from 1967 until 1985, and shared two things in common with Disney’s Haunted Mansion: the omimover ride system (Atommobiles or Doombuggies) and narrator Paul Frees. Rather than travelling on a guided track, Star Tours is a stationary motion simulator. The ride vehicles are military grade hydraulic powered flight simulators. Each cabin seats 40 guests. 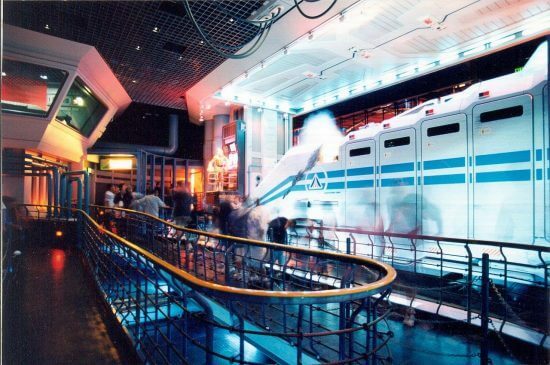 Guests face the forward part of the cabin where the attraction’s action is displayed. The cabin’s motion is synced to the film. For their first Star Tours attraction, Disney purchased four, at a cost of half a million dollars each. The simulator’s action, set within the “Star Wars” universe, was produced by George Lucas and ILM specifically for Disney. Upon entering the intergalactic travel agency, “Star Tours,” guests are greeting by a large flight schedule board which displays departure and arrival times from various locations within the “Star Wars” universe. Just past that, a Starspeeder 1000 is being prepped by R2-D2 and C-3PO. Further along the way several droids are in the process of working on another droid. These “work droids” are actually recycled animatronics: they are the mechanical part of the geese from “America Sings.” At the next and final part of the queue, guests are sorted into boarding rows by a cast member and watch a cute safety and boarding instruction film. Once boarded, travellers were greeted by their pilot RX-24, aka REX (voiced by Paul “Pee-Wee Herman” Rubens). REX nervously admits that it’s his first flight. After a few departure “complications,” the trip to Endor commences. Aided by R2-D2 the ship jumps to hyperspace. The Starspeeder’s hyperspace trip overshoots their destination encountering a cluster of comets. Forced to travel through one of the comets, REX and passengers emerge into even greater danger. Caught in the clutches of the Empire, a tractor beam pulls the ship closer to itself. Rescued at the last minute by an X-Wing on the way to do battle with a new Death Star, REX decides to join the attack force. In a maneuver many “Star Wars” fans hoped to personally experience, the Starspeeder 3000 joins in the assault to destroy the Empire’s ultimate weapon. Upon destruction of the Death Star, REX manages to pilot the passengers back to home, narrowly avoiding disaster in the landing process. Star Tours operated at four different Walt Disney Company theme parks. The attraction’s grand opening at Disneyland in Anaheim California was held on January 9, 1987 (soft opening occurred in December the year prior). The attraction closed on July 27, 2010. In Tokyo Japan, Star Tours operated from July 12 1989 until April 2, 2012. At Disney’s Hollywood Studios (then called Disney MGM Studios), Star Tours opened on December 15, 1989 and the final trip to Endor took place on September 7, 2010. In Paris the attraction operated from April 12 1992 to March 16, 2016. At all four above locations, Star Tours was replaced with an updated 3D version of the ride that included multiple random destinations. 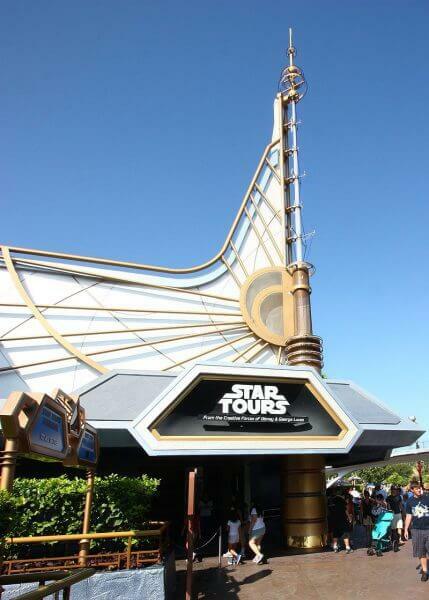 Star Tours-the Adventure Continues is still accepting intergalactic travelers today. A similar style attraction, using the very same ride simulators. Body Wars operated in EPCOT at the Wonders of Life Pavilion. 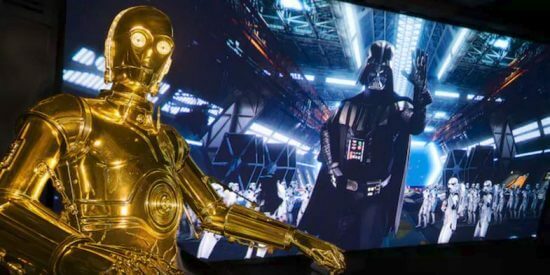 The C-3PO and R2-D2 animatronics in the Anaheim Disneyland Star Tours attraction are modified props that were used in the “Star Wars” films. That’s no moon . . . nor is it an actual Death Star. Death Star III, as encountered and destroyed in the adventure, is actually not supposed to be a “real” Death Star. This was a deliberate decoy intended to distract the Rebel Alliance.